A family of eight in Chickasaw is picking up the pieces after a devastating house fire. The Rideout's were at home Wednesday afternoon around 4PM when they started smelling smoke from the back of the house. Within minutes, the home went up in flames. The plume of smoke was so big that it could be seen from the interstate. “It burned continuously until about 9:30 last night,” said Ali Rideout. Ali Rideout was leaving work when she got the phone call about the fire. She rushed home and was hysterical worried about her children. Her youngest daughter is just two-years-old. “We have six kids and it’s me and Kenny, so, we’re a family of eight,” Rideout said, “there’s no words.so many people have lost and we only lost material things, we are super blessed”. 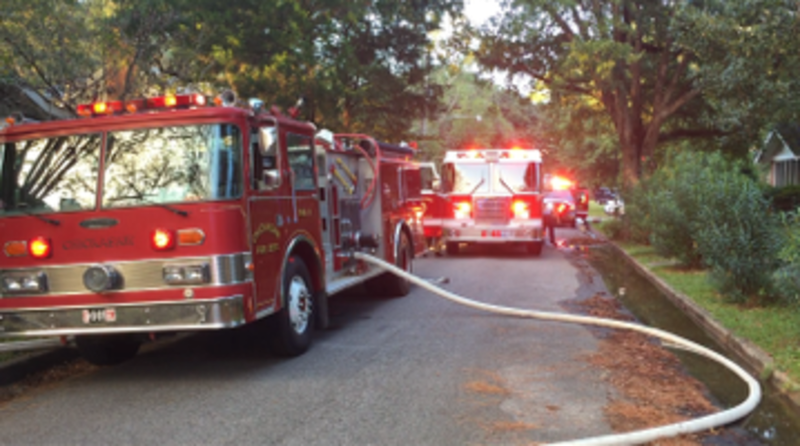 Chickasaw and Saraland fire crews responded to fire that continued to burn for hours. Chris McClean, Chickasaw’s Public Safety Director, had to stop and get additional fluids last night due to smoke inhalation. The entire neighborhood stood and watched the giant blaze and now they are volunteering to help. “I know the entire community is going to rally around these children,” Ali Rideout said.